The Doctor, Bill, and Nardole are asked to read the Veritas, an ancient text held at the Vatican, which causes whoever reads it to commit suicide. But what is this mysterious truth? Well, it's one that we can all relate too- Are the world and ourselves real or are we just a computer simulation? This philosophical debate is not a new subject but it's introduction into Doctor Who works extremely well. The historical period is full of fascinating art and artifacts that juxtapose wonderfully against the pixelated remains of Bill and Nardole, as their simulated bodies glitch out of the computer program. Writer Steven Moffat's sophisticated script is buzzing with clever puzzles and terrifying revelations as Bill and Nardole venture through a finely crafted selection of holographic simulations. The sub-plot with Missy being executed by the Doctor was a smart way of revealing more to about the Doctor's oldest friend, and how she could potentially be if she had a conscious. As of yet, it's unclear why the Doctor swore an oath to watch over her in the vault for a thousand years, but the mystery certainly adds to the excitement of Missy's return. It was wonderful to hear some of River's diary being read aloud; Nardole stating that River had given him permission to kick The Doctor's arse being one of the most memorable of her entries. Her presence was warmly felt; adding a richness to the continuity of the series. 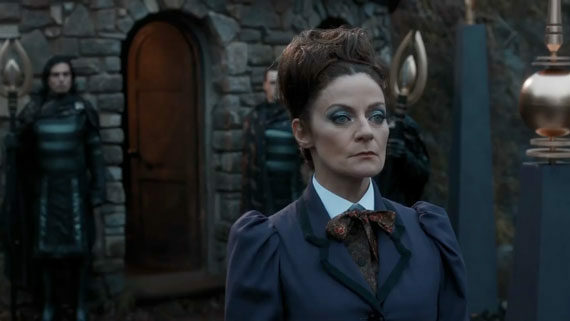 Michelle Gomez's performance was slightly more nuanced and emotional which was fantastic, as it deepens the complexity of her character. Another excellent element of the episode was seeing Bill's life on Earth continue to grow and change. It provides some wonderful moments; Bill's date retreating after the Pope stumbles out of her bedroom is simply hilarious! The quick transition between such familiar human activity to a time machine full of priests is one reason why the series is so fascinating. The plot builds to a disturbing and dark cliffhanger as The Doctor explains to Bill that she's not real, that none of the world is and his perception of Super Mario is more horrifying than you could ever imagine! With the mystery of who is in the vault revealed (You should know it's Missy by now), another manifests in the form of the rotting and grotesque Monks who have been creating simulations as a test to experiment on how best to conquer Earth. It will be interesting to discover why the Monks want to invade seeing as the concept has been attempted so many times before. Extremis is a mysteriously dark and profoundly sophisticated story that challenges the rules of what the show can achieve to create something truly unique.